Our goal is to enable pilots with enhanced safety analytics to support their unmanned operations. As you get started with the OneSky web portal, it is important to remember that each pilot is ultimately responsible for the safe operation of their aircraft within national airspace. Our analytical capabilities are meant to provide helpful guidance to pilots and bring safety to the forefront. You can login to the OneSky web portal immediately to begin submitting flight plans and using OneSky's safety of flight analytics. Because the web portal is evolving and we are currently in an early Beta phase of pre-release, you may notice changes to both the interface as well as the capabilities listed in this guide. We hope to continue to expand our flight safety analytics beyond what is listed here and will work to keep this guide up-to-date and reflect the current capabilities and suggested usage. Within the OneSky web portal you will notice the 'Library' panel which is where most of the content creation and management of flights will occur. You can choose to add a new FLIGHT or MAP LAYER (more about this option later). After you have added a new flight, you should notice that OneSky currently supports two distinct types of flights meant to reflect the typical operating conditions of small UAS pilots. POINT FLIGHT - This is defined with a single point (lat/lon) with the ability to define both the radius of the expected operation as well as the maximum altitude (AGL) in order to define a fully qualified flight volume of operation. The Start Time and Stop Time/Duration of the operation must also be supplied. PATH FLIGHT - This flight type is defined with a collection of waypoints meant to depict the actual flight route that an aircraft is expected to adhere to. This should be closely related to what a UAS may perform while in an 'autonomous' mission mode. This type of flight is defined with time-stamped waypoints, which means that each waypoint will inherently have a time associated with it. The API provides several methods for supplying well-defined Path Flight flight plans into the system, but the GUI is meant to provide a more simplistic approach by allowing a user to provide the starting time of the operation and an average vehicle speed. You can click-out the flight route on the globe to begin creating a representative flight path. Each waypoint can be moved/adjusted as well in both lateral position as well as altitude (AGL). OneSky analytics are driven by an expanding list of analytical web-services designed for aerospace professionals who wish to include parts of AGI's core analysis tools such as Navigation/GNSS Prediction Services, Satellite Overflight Visibility, Advanced Communications Link Budgets, Airspace Intersection & Proximity Services, etc. More details about these core web-services can be explored on AGI's Sofware-As-A-Service portal. 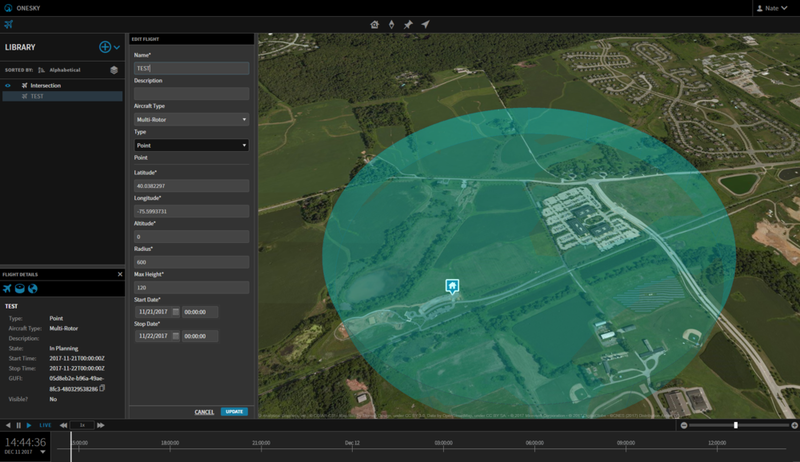 OneSky users have the advantage of utilizing a tailored subset of these overall analytical capabilities specifically designed for UAS. This collection of flight analytics can currently be seen as individual tools on the 'Analysis Ribbon' within the OneSky web portal. Keep in mind that developers and integrators can take advantage of these through the OneSky API as well! The GPS Navigation service will provide an overview of the predicted GPS/GNSS situation that can be expected based on the location and time-span of the flight. This is especially useful to confirm that an expected number of satellites will be available throughout the duration of the operation as well as an overview of the navigation solution's quality in terms of Dilution of Precision (HDOP, VDOP, PDOP, Etc.). These are all critical metrics that any GPS capable UAS system should consider before launching. Explore the GPS/NAV analysis for each flight, paying attention to some of the reported metrics such as the min/max expected HDOP and the min/max #Sats. These will give you a good idea about the overall health of your GPS solution during the planned flight. Tip: HDOP above 2.5 is typically not advised. If you notice predictions that have higher HDOP or a smaller number of available satellites, it may be advisable to pick a different location with a clearer/less obstructed view of the sky or perhaps change the time at which you plan to fly. Satellites are constantly moving in the sky and because of their dynamic nature, you will experience different results at different times of the day. OneSky will check flights against various airspace data sets and return information regarding the ability of UAS to operate in the areas defined. Some of these considerations include controlled airspace, special activity airspace, proximity to airports/heliports, and even the FAA's Low Altitude Authorization & Notification Capability (LAANC) data which provides guidelines for commercial UAS pilots attempting to operate within controlled airspace. The rules/regulations controlling where you can operate is ever-evolving, and the FAA continues to provide guidance on integrating small UAS into the national airspace so please be aware of current rules and regulations regarding small UAS operations. The OneSky interface makes it easy to understand these airspace issues while you plan flights. The first step in this process is bringing the data to you in a visual manner. This is accomplished with various data layers being presented on the globe for quick-look understanding. 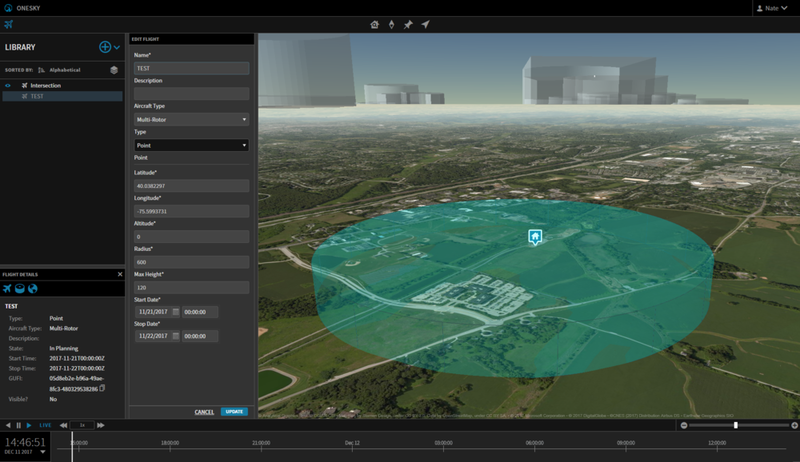 From 3-Dimensional controlled airspace volumes, to color-coded restricted areas and airspace proximity, OneSky helps to make understanding the landscape a bit easier! Airspace analysis is checked with the appropriate icon in the Analysis Ribbon. This will open an analysis panel showing all appropriate airspace considerations. While some will be warning or cautionary advisement, others may show up as violations which will mean that under no condition will UAS operations be allowed in the area you have defined. Airspace analysis conducted along a 'PathFlight' type will result in the flight route being colored based on airspace intersections and proximity. The concept of 'ground' plays a critical role in most UAS rules and regulations. It is common to have upper limits on airspace, permissible altitudes, and mission plans referenced to local ground or heights measured as 'above ground level' (AGL). 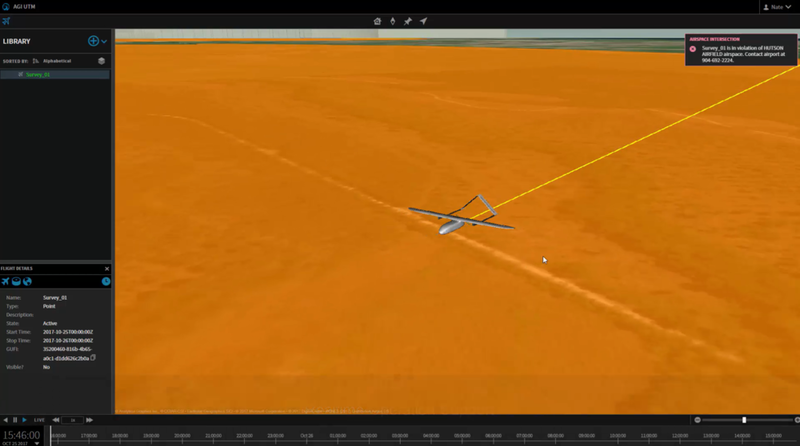 This is a convenient way to communicate and understand altitudes when an aircraft is within visual line of sight of an operator, therefore it is important to have an accurate representation of the surrounding terrain. This benefits mission plan analytics such as a flight's route maintaining appropriate altitudes above 'ground' or perhaps how the local terrain may impact an operator's visual line-of-sight. 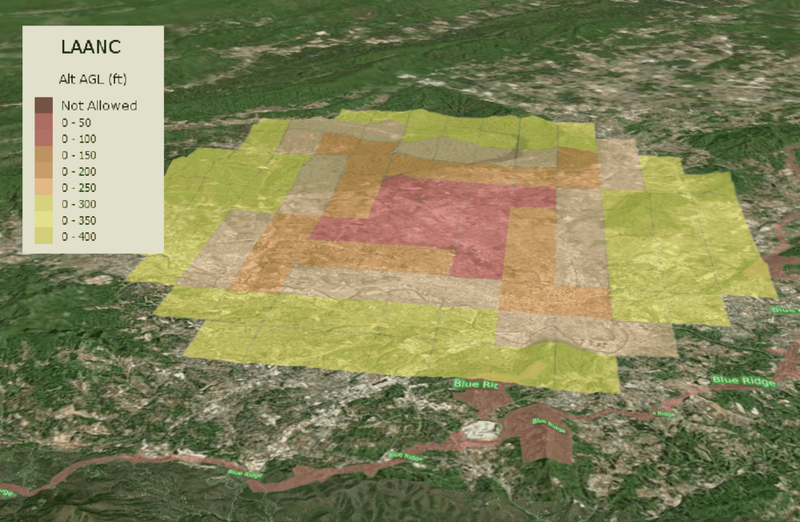 OneSky utilizes an advanced Terrain Server which provides the underlying hi-resolution terrain data. This data is used both visually as well as analytically for many aspects of the OneSky system, from defining waypoint altitudes and checking upper limits of airspace to visualizing line-of-sight constraints from an operator's perspective. 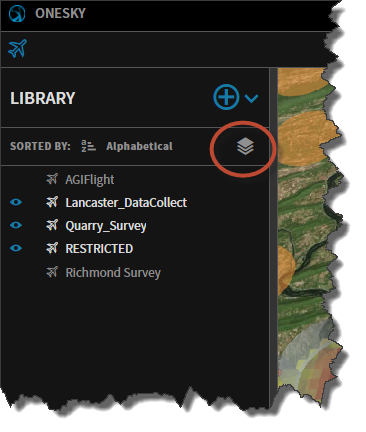 To explore various terrain effects, simply click on OneSky's Terrain Analysis icon for any individual flight. If the flight is a waypoint flight, you will notice the entire route sampled to show height above terrain for the entirety of the flight path. Note: You will also notice this terrain intersection analysis while PLANNING a PathFlight within OneSky. As you click and/or move waypoints, segments of the flight between waypoints are continuously checked for terrain intersections and will show up instantaneously as 'RED' segments until they are moved/corrected. For PointFlights, the terrain analysis will result in a visualization of the local terrain impact from the center of the operating volume. You will notice a red 'viewshed' effect which highlights the areas where terrain would impact the line-of-sight between the operator and the aircraft. Essentially, areas below the red viewshed will suffer from a loss of visual line-of-sight to the operator. You will also notice a graph of Azimuth vs. Elevation which represents the lowest altitude/azimuth that an aircraft could fly and still maintain line-of-sight with the operator (calculated at the maximum radius of the flight plan). You will automatically see any 'LIVE' flights that other users may be supplying to OneSky. These will show up on the globe as icons noting their current position. Clicking on any of these will reveal additional information about that particular flight such as the start/stop time of the operation in the Flight Information box. You will also see the flight plan information displayed on the globe such as the registered flight path in the case of a multi-point (PathFlight) flight plan or perhaps the volume of the single point (PointFlight) flight plan. Note: If you are interested in supplying Realtime position information for your flights, you can take advantage of OneSky's RESTful API which provides an endpoint for supplying your realtime telemetry positions. One common method is using popular Ground Control Station (GCS) software such as Mission Planner and using the in-line Python Scripting option. If you are a Mission Planner user, you can get started with one of our example scripts which can be used to both supply OneSky with your intended flight plan as well as supply realtime position updates to OneSky while you are flying. One of the immediate advantages in supplying realtime positions to OneSky during your flight, is the realtime notification and alerting engine. OneSky will continually analyze your flight's current position and issue notifications and alerts regarding airspace intrusions and/or proximity to airspaces that you may be concerned with. These realtime analytics will continue to expand during the BETA phase to include additional capabilities such as communication link analysis, proximity warnings to other air traffic, and a growing list of analytics currently being developed by OneSky, so be sure to check back often for updates on these capabilities.